Delivery Method – Candidates will participate in EMS Cognito facilitated workshop which will comprise of theoretical based learning and task-based exercises. The theoretical based learning will typically be delivered through the method of presentation from an EMS Cognito consultant. Training manuals will be issued to each candidate with copies of the task-based exercises lead by the EMS Cognito consultant. Assessment – On completion of the workshop, candidates are required to complete a theoretical exam. The exam will be in multiple-choice format and each candidate will be given 40 minutes to complete the exam in test conditions. The next stage of the award comprises of two units, the joint assessment for both units must be completed in order to achieve Level 2 of the Lean RCM™ Award. Candidates who achieve this level must complete level 1 first. On completion of this level, candidates will be able to actively participate in Lean RCM analysis and implementation. Delivery Method – Delivered as part of IMPACT Masterclass™, candidates will be required to participate in an EMS Cognito facilitated analysis session and from their findings implement the improvements identified. Assessment – Candidates will be required to complete a combined electronic workbook for units 4 & 5. Candidates are required to show evidence of the key skills required to facilitate a group, demonstrate how to assimilate data for MTBF values, how to use MTBF data to determine whether a maintenance task is feasible or not and demonstrate how to analyse complex failure finding scenarios. Candidates must complete units 1, 2, 3 and 4. On completion of this unit, candidates will have been validated to independently facilitate the Lean RCM™ programme. 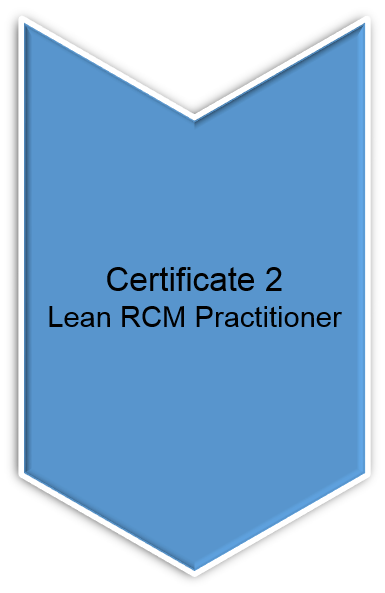 Delivery Method – In order to complete level 3, the candidate has to lead a Lean RCM™ masterclass programme during which they will be supported and validated as competent by EMS Cognito during 7 days of the 15-day programme. Assessment – Candidates will be required to complete a combined electronic workbook for units 4 & 5 (as above). Further to the electronic workbook, the candidate will undergo observation and validation through the programme facilitation.